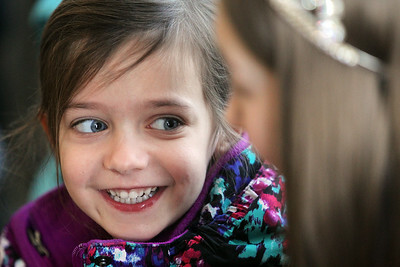 Matthew Apgar - mapgar@shawmedia.com Chesterbrook Academy pre-kindergarten student Finnley Wilke chats with Bernotas Middle School 7th grade student Julia Gilmore after making a substantial food donation at the Grafton Food Pantry on Monday, Feb. 12, 2018 in Huntley. Students and their families collected approximately 150 pounds of food in their 8th annual "Share The Love" food drive to donate to the pantry. Matthew Apgar - mapgar@shawmedia.com Chesterbrook Academy principal Sandy Jenner hands a bag of food to Finnley Wilke to bring in for a donation at the Grafton Food Pantry on Monday, Feb. 12, 2018 in Huntley. Students and their families collected approximately 150 pounds of food in their 8th annual "Share The Love" food drive to donate to the pantry. 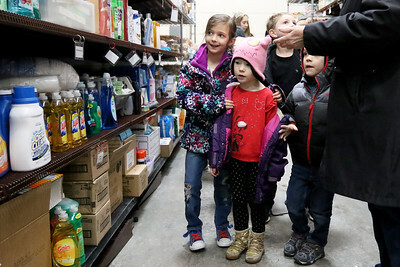 Matthew Apgar - mapgar@shawmedia.com Chesterbrook Academy pre-kindergarten students (from left:) Anabelle Fischer and Finnley Wilke look in awe of the amount of food and essential supplies during a brief tour with Board of Directors Harriet Ford (right) at the Grafton Food Pantry on Monday, Feb. 12, 2018 in Huntley. Students and their families collected approximately 150 pounds of food in their 8th annual "Share The Love" food drive to donate to the pantry. Chesterbrook Academy pre-kindergarten student Finnley Wilke chats with Bernotas Middle School 7th grade student Julia Gilmore after making a substantial food donation at the Grafton Food Pantry on Monday, Feb. 12, 2018 in Huntley. Students and their families collected approximately 150 pounds of food in their 8th annual "Share The Love" food drive to donate to the pantry.